“Liberty, equality, fraternity, or death; – the last, much the easiest to bestow, O Guillotine!” Charles Dickens. The voice of the people has finally been heard, King Wenger has been dethroned and the search for a successor begins! The underlying purpose of a revolution is to achieve some sort of reform. For example, when the French Revolution broke out in 1789, its main purpose was to address the financial problems of the governing regime that had seen the peasants taxed so highly to pay for the extravagances of the aristocracy and wars abroad, they could no longer afford to feed themselves. The revolution taking place at Arsenal right now, equally has its roots in the allocation of financial resources (building a stadium) taxing the fans too highly (the highest priced season tickets in world football) and a complacency by the management that the supporters would passively accept whatever morsels of cake were thrown their way. Indeed, the necessity for change at Arsenal has been apparent for over a decade and Thursday’s 1-1 draw against a 10 man Athletico, merely illuminated on the problem. Loads of possession, pointless passes, not clinical enough upfront, until finally the high line defence gets broken down and the opposition scores. It’s been the same old story for years, the tv audience could see it, the commentators would analyse it, and the fans should quite rightly feel aggrieved and frustrated by performances on the pitch, and yet despite all of this, nothing got done. 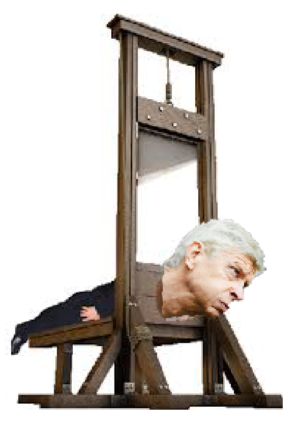 Before eventually the unrest on the terraces became so great and resistance so high, the chairman was forced to act, and Wenger’s head was offered to the people. The truth is that in times of turmoil, people look for a scapegoat to sacrifice. Marie Antoinette served that purpose in the French Revolution and Wenger at Arsenal. I have no doubt the current Minister for Health, he whose name cannot be said for fear of profanity, is likely to be the scapegoat for the current establishment. However, people forget that when Arsene first came to England, he was himself a revolutionary figure, changing the way players trained, and ironically placing a much greater emphasis upon nutrition, being well aware of the dietary limitations of this country. “What’s really dreadful is the diet in Britain. The whole day you drink tea with milk and coffee with milk and cakes. If you had a fantasy world of what you shouldn’t eat in sport, it’s what you eat here.” Arséne Wenger. Wenger clearly wasn’t from the Marie Antoinette school of ‘let them eat cake,’ he was used to the healthier Japanese diet, where there was a greater emphasis on fresh and unprocessed foods, with very little refined sugar. But, somehow that all changed once the go ahead for the new stadium was given, his hands became tied, the financial shackles were applied and instead of investing in defensive players to strengthen the team where it was most needed, he was forced to preserve the “belly bank” coffers. Wenger, effectively was under the control of the Chairman and the directors and toed the party line, to the detriment of the health of Arsenal Football Club. I know many GP’s today who feel their hands are similarly tied by the current dietary guidelines recommending a balanced diet with an emphasis on fibre, low saturated fat and ‘healthy’ grains, to deal with the problems of obesity and diabetes, which has had an equally deleterious effect upon the masses! Our Stadia (bodies) continue to get bigger, and at what cost? The cost of our health! Because, when you try to fill up a bigger stadium with even more fans (carbohydrates) without improving the way the team plays, then you just get even more resistance on the terraces and the situation quickly becomes inflamed, often with tragic consequences, increasing the risk of type 2 diabetes, heart disease, dementia and cancer. Worse still, when the only/first solution offered is the purchase of new strikers (drugs) to compensate for a leaky defence, you begin to question the judgement of the management altogether and resistance increases even further. No wonder there is an uprising amongst the medical fraternity. The recent address at the European Parliament by Dr Malhotra, on the current madness surrounding dietary guidelines is just the beginning. Many more reformers are collaborating on the best way forward; Dr Fung, Dr Kendrick, Dr Noakes, Dr Baker, Dr Unwin, are an emerging army of physicians, backed up by “Citizen Scientists” from around the world like; Dave Feldman and Ivor Cummins, each carrying out their own N=1 experiments and joining forces to unravel the truth and provide the evidence needed to overthrow the current regime. The revolution needed in medicine and health care right now, demands a shift of resources away from expensive strikers (drugs and interventional surgical procedures) towards a strengthening of teams defences, or, in other words, preventative lifestyle measures. Simply because, that’s where the most gains to people’s health are to be made. The 6 or 7 paragraphs on dietary management you find in the 44 page guidelines for type 2 diabetes, is the equivalent of Wenger reportedly spending only two minutes on defensive play during each training session. It’s both negligent and nonsensical. Of course, supporters may moan at the way Wenger has managed the club, but the Chairman and directors must surely take their fair share of the blame, because ultimately it has been their desire to maximise and safeguard profits, over strengthening the team that has left the club so metabolically challenged and the fans in such a rebellious mood. However, if we are really honest with ourselves, it’s not much different to the way the majority of us manage our own clubs/lives. We think we are doing the right thing by following the recommended advice, but, when results don’t improve, instead of questioning and changing those tactics, we continue with the same game plan, because that is what we have been advised to do by the powers that be and that is what the Chairman of the club – the subconscious mind – has been conditioned to believe in. We need to stop blaming individuals for eating the highly addictive and emotively advertised junk food and start admitting that changes need to be made not just at managerial level, but also in the boardroom, because they too can get things wrong. Unfortunately, in terms of the dietary guidelines and type 2 diabetes, they are not just wrong they are bordering on insane! In a previous blog (football tragedies) I argued that to recommend carbs to insulin resistant patients, is like ordering the gates at Hillsborough to be opened and allowing even more fans into the stadium with crushingly tragic consequences. Because, when the stadium is already crammed to capacity and the fans inside are gasping for breath, you simply cannot allow more to enter the ground and make the situation worse. So, if there is to be a starting point for a revolution, let this be where the rebellion begins. Maybe, this is the kind of revolution we all need, one which not only encourages a reallocation of resources towards promoting better health and wellness, but also changes the way we think about health itself. Instead of passively relying on experts and the state to inform and guide us, we should actively seek to find the best tactics to use for our own teams based upon the particular strengths and weaknesses of our club. And in order to do that we must first eradicate some of the Hooligan’s from the terraces of our minds, those self limiting beliefs that stop us from changing tactics, and adopting healthier lifestyles. The French Revolution famously produced three very powerful ideas, or concepts: Liberty, equality and fraternity. Hopefully, the revolution at Arsenal will witness a liberation of the purse strings to bolster the team’s defensive fragilities and give the squad a much better balance. As well as helping to re-unite the fans and transform the “gooners” into a Super Club once again, capable of competing for European glory. Similarly, the revolution in medicine and the dietary guidelines in particular, must allow an escape from the mind prisons of; fat is bad and balance is good, and place diet and lifestyle changes on an equal footing with medicines and surgical interventions, to help redress the imbalance that currently exists. 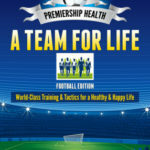 Before finally, “The People” and the medical profession come together, and take back control, in order to discover the truth for themselves, which is that most of our teams don’t need expensive strikers (drugs) to be healthy and play well, more than anything they need to strengthen their defences (immune systems) and stadia (bodies) with lifestyle modifications, and keep their teams in shape, playing with purpose. Play Well, Keep your Teams in Shape, and take Care! ← Arsenal – Fat Boys of the Premier League!